Finding the cost of CCTV system for your home can be difficult – and even more challenging to find a comprehensive home CCTV price guide to help you make an informed decision. If you’re currently looking into house CCTV prices and you want to know the options that are available to you, we’ve created this article to help you. We’ll not only provide realistic price ranges for different types of cameras and CCTV systems – we’ll also highlight important aspects you must consider before making that all-important purchase. You may be wanting to purchase a home CCTV system as a security measure so that you and your family feel safer in your home. If that’s the case, you’ll need a CCTV camera and system you can trust and that’s easy to use. The problem is that there is so much choice available that we often don’t have the time to fully investigate different systems on the market and we end up instead choosing to buy the first camera we see to save time. What should you consider before purchasing a CCTV system? For whatever reasons you want to install a home CCTV system, you should consider first whether you need internal or external cameras. Perhaps you’ll decide you require both – there is no right or wrong answer as it all depends on your personal circumstances. What is it you want to protect and where will the cameras need to be to see it? You’ll also think about where you will store footage gathered by the cameras – you could choose a hard drive on your property or in the cloud. Storing footage in the cloud can be beneficial because you can access it from any location whereas, if the footage is on your hard drive, you may need to be in the same room as your computer to access it. In addition, if you are unable to locate the hard drive, it breaks, or it’s stolen, you’ll most likely have an issue with recovering footage if you didn’t have copies stored in the cloud. Many CCTV systems now give you the ability to receive notifications and watch live footage via your mobile phone. This is perfect if you want to be able to see what is happening at home at certain times or if you just want the peace of mind that everything is well. With this ability, if anything bad ever happened like as a burglary or fire and you happened to check the live footage when you were at work – you could act immediately by calling the police or fire brigade. It’s not just burglaries you can use CCTV to monitor – you’ll be able to check what your kids are doing in your home while you’re out at work or away. You can now even select a camera which lets you watch live footage of your home from anywhere in the world and will actually project your voice so that you’ll be heard by the people in your home at the time. There are many new and exciting advancements in CCTV technology meaning that you can really customise your system to do exactly what you want it to do. What are the legal requirements for CCTV at home? You can get government guidance here. One other important factor to consider is camera resolution. If you buy a home CCTV system which records pictures at a resolution lower than 720P, you’ll struggle to see important details such as faces. If you wanted to give the footage to police as evidence for a crime that had taken place, low resolution footage won’t be sharp enough to help convict the person who burgled your house or damaged your property. Cameras which record at 1080P gives you the high quality results the police will be wanting. You could go one step further by purchasing a system that records in 4K ultra definition. The resolution of your recording isn’t the only important factor though. If you choose the wrong frame rate, you may struggle viewing details in your recordings. You should aim to buy a camera that records at 15 frames per second so that movements and events captured on the footage look natural. 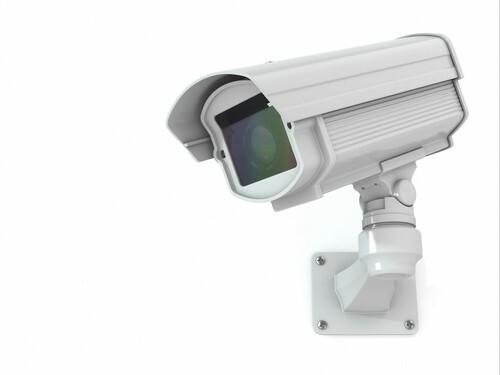 Get FREE CCTV Quotes Today! If you want footage that shows events unfold in ‘real time’, you should choose a system which films and records at 25 frames per second. Be careful though because many budget cameras to not give you an option to manually adjust which frame rate to use. If your aim is to capture important details such as people’s faces, a rate of 12 to 15 fps will be suitable. You can, of course, set it higher to something like 30 fps but if you choose a hard drive to store the recordings on, the storage will reach capacity far quicker because it’s recording so much more information per second. The table below shows the typical costs of having home CCTV installed. Below the table is a more detailed explanation of the different systems. If you want a basic system, you might want to think about installing between 4 to 8 internal and/or external cameras. Your cameras would all be connected to a hard drive or to the cloud by cables. If you’re using a hard drive, this type of system usually comes with 1TB of hard drive footage – enough storage to record approximately 2 weeks’ worth of footage. This would work well for you if you want to record footage whilst you’re on holiday as the capacity of this system is ideal for the typical length of a holiday. So, what sort of prices do basic systems attract? An entry level system is priced at around £225 with 4 cameras. If you want professional installation, you’ll be looking at an additional £300 for labour costs. If you decide that you require an 8-camera system, you should expect to pay approximately £400 and a further £500 for installation fees. Wireless CCTV systems have many advantages over wired systems. You have far greater flexibility in the locations where you can place the cameras and you don’t have to worry about hiding the eyesore of a tangle of multiple wires covering your home. Because this type of CCTV system is wireless, the cost of installation remains low as does the time needed to set the cameras up. A mid-range system is ideal for those wanting to install a CCTV system but don’t have the time to wait for a professional to set it up. The elimination of wires could make the installation a quick and simple DIY project for those with the necessary skills. A wireless mid-range system with 4 cameras, all at a high quality of 1080P will cost you around £450 with installation costing around £300. For an 8-camera system, you’ll need to budget for around £800 with another £500 for professional installation. A mid-range camera can provide you with suitable quality for a reasonable price which makes this type of CCTV system an ideal choice for home owners. High-end CCTV system (including outside house cameras)? Although it’s not always the case, home CCTV really is a market where the more expensive the system you choose is, the better. You’ll benefit most from a high-quality, high-specification system. The installation process for this type of system is significantly simpler as it is connected to your home’s Wi-Fi, minimising the number of cables your installer needs to use. This Wi-Fi connectivity allows you to watch live footage of your home – a real help if you’re on holiday or even out on a day trip. It’s always good to have the peace of mind knowing that your home is safe. Furthermore, you benefit from two-way communication between you and whoever is in your home. This feature can be particularly helpful if you work long shifts and miss a delivery – you can give instructions to leave the package in a secure place for you. High-end CCTV systems come with full 1080P high definition at a high frame rate of 20 fps and upwards so your footage is always of the highest quality and accessible from anywhere as it takes advantage of online storage. Your footage isn’t just sharp during the day either these systems have night vision for a clear image for when it’s dark. Although you can choose to receive notifications of movement in and around your home, you aren’t constantly bombarded when family members or households’ pets arrive at your front door as the system comes with facial recognition. There are several high-end CCTV systems on the market, Nest being one of the more popular options. What is the cost of the new Google CCTV-based system? Several types of high-end CCTV systems exist however one of the more popular choices is Nest – a system created by Google. Up to 10 cameras can be installed with the Nest system each with its own power cable and they all simultaneously connect wirelessly via an app. If you chose this CCTV system you are given the option between a 10-day or 30-day storage capacity – however, the price of online storage is arguably its biggest drawback. Whilst the cameras are competitively priced as is the installation fee, online storage under the 10-day option is £8 a month, or £80 a year for one camera with each additional camera priced at £40 a year. The cost of online storage can steadily add up to a significant bill, especially if you install the 10 cameras the system allows for. If you chose the 30-day option for online storage you face a bill of £24 a month or £240 a year for your first camera. Each additional camera will set you back £120 a year however internal Nest cameras are cheap to buy and install so even when the high price of online storage is considered – you still can still make a considerable saving depending on how many days of storage you select and the number of cameras you install. If that sounds like too much (and it is for many homeowners), then it’s best to speak with a local installer about a more bespoke system with more manageable monthly fees. What’s the difference between a low, medium and high-end CCTV system? Each CCTV system can vary by brand, so it’s important to research the type of cameras you plan to purchase. The most notable difference between mid-range wireless systems and basic systems is the elimination of wires as this can prove to be a big advantage. When installing a mid-range system, you have greater flexibility in your decision for camera placing and installation could prove to be a quicker task. Although high-end systems have a monthly or yearly cost alongside an upfront fee, this type of system has several advantages over mid-range and basic systems. High-end systems, such as Nest, feature night vision, two-way communication, facial and pet recognition, notifications to your mobile phone and several other abilities. Only a few of these features are available in mid-range or basic systems so although you face a higher fee you receive multiple advantages with a high-end CCTV system. How can you save money in home CCTV installation? Although the modern technology of Nest is attractive with its list of additional benefits including live footage streamed direct to your phone, installing enough cameras to provide full surveillance of your home could easily leave you with a hefty annual bill – making this option undesirable for many homeowners. Basic CCTV systems which record to a hard drive could provide you with suitable quality and save you hundreds of pounds. The systems do require an upfront fee for both the camera and installation however no ongoing charges are applied – providing a cost-effective alternative to expensive systems. If you have the necessary DIY skills, you may consider installing the system yourself as this will be the most cost-effective approach. You will need to know how to properly drill holes for the cables and screws to hold your cameras in place. We would only recommend those who are confident with DIY skills undertake this type of job. Do you want a free quote? As we’ve seen, you can get a home CCTV system for very little money. However, choosing the cheapest system doesn’t mean that it’s going to be right for you and your family. There are so many optional extras that add real value to a CCTV system you can select. It’s better to let someone who installs CCTV for a living give you the best advice on the number of cameras, where they’re positioned, the angle of filming, feedback to either a hard drive or cloud computer, and more. By filling in the form at the top of this page, you can get 3-4 free quotes from local installers of CCTV all checked by us to make sure they have the skills, qualifications, experience, and affiliations needed to provide you with the right CCTV system for your home and who can do all the CCTV camera fitting for you. Our partner installers will each give you a quote – free of charge. No salesman will call – it’ll be the installers themselves. Our service to connect you to them is free and you’re under no obligation to accept any of the quotes given to you by our partner installers. Get Your FREE CCTV Quotes NOW!